Today, we decided to do a balanced game to try and work out some of the less than clear rules in the BTLB2 rulebook. We have had several games disrupted by trying to work out how the rules work in different situations, so decided to push the envelope a bit! I deployed 2 elite squadrons (Gendarmes de France) supported by 2 normal squadrons on our right flank. I had 2 elite (Gardes Francaise) battalions with an Irish and French battalions behind them. On my left, Rod deployed a similar group of Battalions. His cavalry were Bavarian, 3 squadrons of Regiment D'Arco (Kuirassier) and the single Guard squadron Hartischer behind. Opposite my cavalry, Ian deployed 4 Austrian Kuirassier squadrons. To their right was 4 battalions of Austrian infantry. ...and 4 squadrons of Danish horse, behind a wood. At game start, the Austrians advanced on me. The British advanced on Rod. Rod's cavalry advanced in echelon. His infantry moved forward in their support. My French infantry could not move...no matter. I had my horse moving to engage the Austrian Kuirassiers. A single casualty made Rod's German regiment Greder shaken! The first die roll of 1, we were to see more! My Gendarmes Ecossaise charged an elite Austrian squadron. Ian's second unit tried and failed to reach my Gendarmes Anglaises. My Gendarmes Ecossaise failed to hit the Austrians and were massacred! The Bavarians on the other side were steering clear of the advancing British infantry, and were forced to attack via the wood. The Danish behind the wood were happy to wait there. The British infantry began to expand into 2 lines. ... as their front squadrons of horse cut through my Gendarmes. Only my Metropolitan squadrons of Regiments Cosse and D'Orleans remained! The Bavarian cavalry pushed on through the light woods. My 2 remaining squadrons failed to charge (more 1's) - and were swept away. The Austrians came round my flank, almost intact. Fortunately, earlier, having seen how things were going, our gun had turned to protect the collapsing flank. A single shot routed the lead Austrian squadron! The Austrian infantry now advanced, and my French infantry advanced to counter them. Rod was already in a firefight with the Platoon firing British...and losing. Curiously, his horse got trapped in the wood, and his Guard horse turned to threaten the flank of the British, but they were too few. With our position collapsing, the French called it a day and withdrew. When the dice are against you, you are powerless to resist! The game brought up some interesting situations the rules were unclear on. That was the point of the game. I think the game was less satisfying than most as I never threw a 6 all day, and at least 80% of my rolls were 1 or 2! We all have days like this! Ah well, never mind, there's always another game to look forward to! Brittany spears... meet the Vikings! Today, we did a Dark ages skirmish game..or two! We were using my own 'Sword and Dagger' rules and the forces were Phil's and my Normans against Lawrence, Ian and Rod with Vikings. The game allowed me to get my little stone house out! The battlefield, Vikings to the left, Normans and their Breton allies to the right. Mine, to their right, were a mix of Norman types. We started screened from the Vikings ahead. Only a small force, so where were the rest of the raiders? ..Obviously, lurking behind a large wooded hill! ...The Brittany spearmen in the lead. 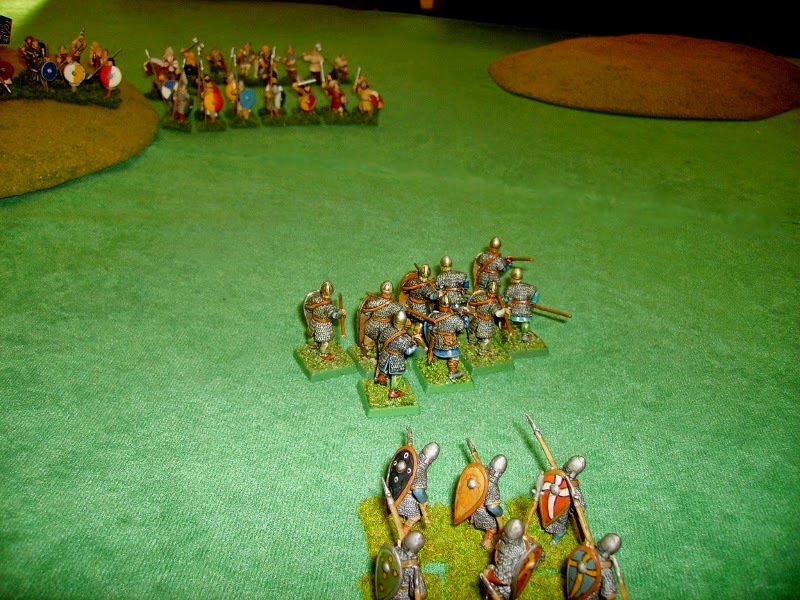 Seeing their advance, a small body of bow and spearmen stepped forward from the Viking line. 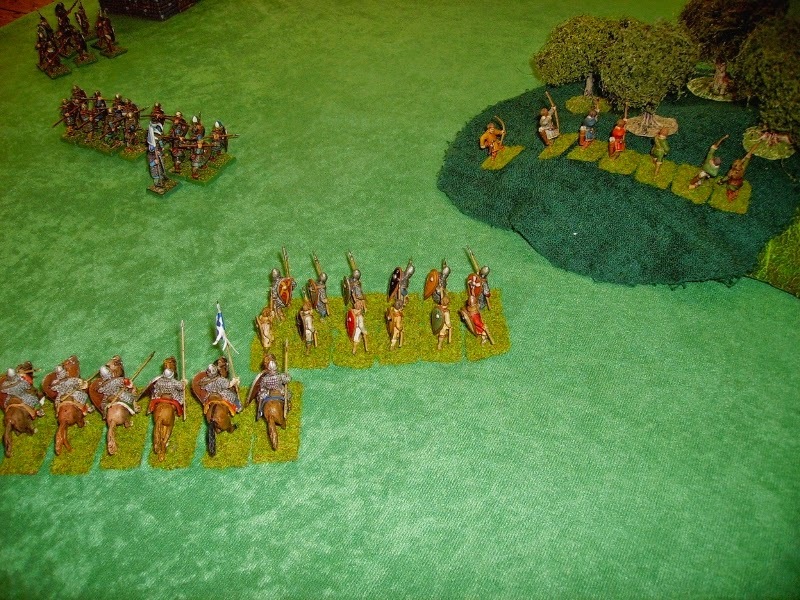 The rest of the Vikings now appeared from their wood, would they swing on the Norman flank? The Normans deployed behind the Bretons. ...who were steadily advancing on the Vikings. 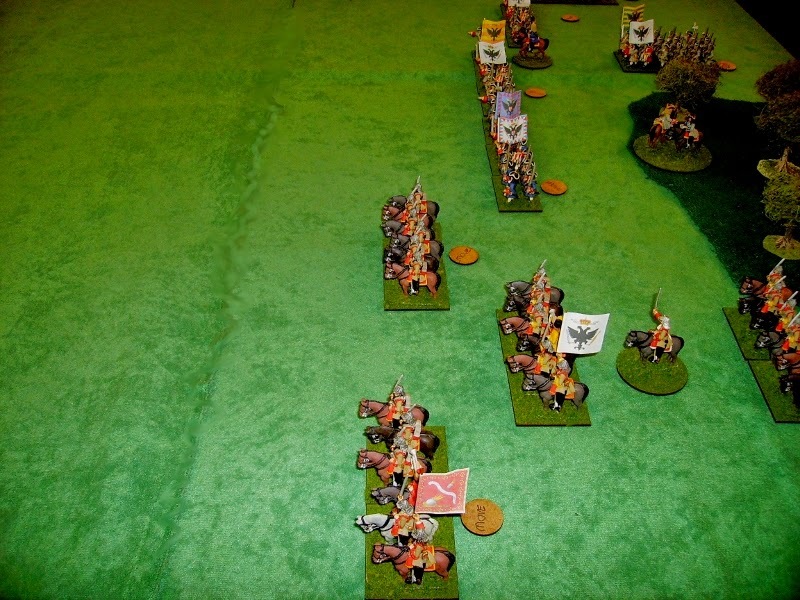 The Viking archers got sight of my Knights - though their arrows had no effect. ...The Vikings in the wood emerged, would they attack the Norman flank? However, the small Viking force on the hill decided they were too far away and withdrew from the battle! The Norman/Bretons had won an almost bloodless victory! - the problem with the Vikings was apparently due to a misunderstanding between the players, who were not sure who was supposed to be supporting who! We decided to have another game, as we would probably have time! ....opposite a now concentrated Viking force! ...our deployment was designed to threaten the flank of that deployment. The fact Phil had not chosen some archers in his force, preferring to go for spearmen,meant we could only attack. ...and began long range shooting. The heavily armoured Bretons were not impressed! We continued to advance, I deployed my archers in the wood to support our advance. My Knights followed some Bretons on a wide outflanking move. The Vikings began to pivot round the hill to face them. The Breton first line, supported by my Norman spearmen, moved to attack the Viking left. Having less armoured men, the Bretons bravely took the Viking shooting, which continued to bounce harmlessly off their mail! My archers finally got into position to engage the Viking right at long range. The Vikings were still trying to shoot the Bretons, who were closer! Our flank attack was now nearly in position. The Viking archers changed target, and caused a light wound on one of my spearmen! The Vikings decided to withdraw their left more, to protect their flank. My archers began to get the range. Not surprisingly, a Viking archer, at this short range, finally slew a Breton. The brave Bretons nonetheless attacked and drove into the Viking line. The Vikings charged another Breton unit with Berserkir. Despite the other defenders of the hill being beaten by the Bretons. Another of my unarmoured spearmen was, meanwhile, wounded by an arrow from the Viking right. My spearmen now charged in to support the Bretons. All that was needed was the dismounted Breton knights and my mounted Knights to charge and victory would be ours! But at this junction, we ran out of time! I am sure the Vikings felt they could have still won, but we will never know! The Vikings retreating to avoid the Norman attack meant we hadn't the time to finish the game, rather disappointing for sure, but we still had fun!